Shirts With Random Triangles: Christian Hackenberg Declares For 2016 NFL Draft, Is An Ex-Penn St. QB. Hackenberg described his decision to leave Penn St. as "tough." "You've invested so much into a place and invested so much into fixing things and making sure it's where it needs to be." Hackenberg was knocked out of action in the 2016 TaxSlayer Bowl during the second quarter after spraining his right shoulder. 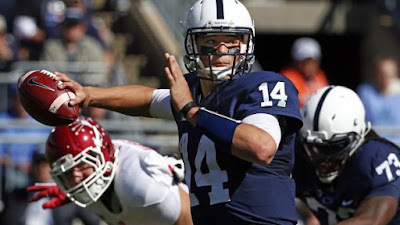 Hackenberg began his career at Penn State while the team was under NCAA sanctions following the Jerry Sandusky scandal. He was named the Big Ten Freshman of the Year in 2013. He went on to a record of 8,457 passing yards, with 48 touchdowns and 30 interceptions. The Nittany Lions went 21-17 in Hackenberg's three seasons in Happy Valley.